Order now on-line with the built-in PayPal shopping cart. "IHS Press Group" fundraising has started, as of the Feast of Christ the King, 2011. Contribute now (below) or see our fundraising page. Watch for an Important Announcement. 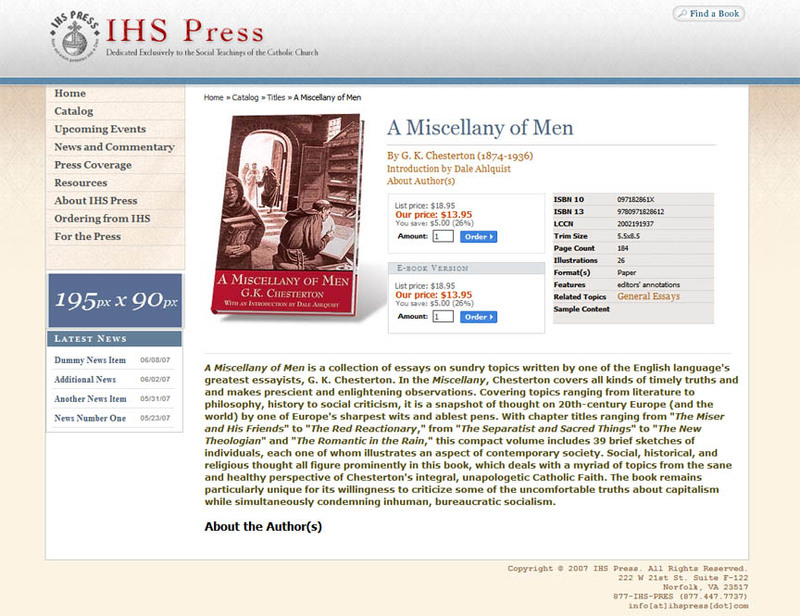 (Oct. 26, 2011) IHS Press -- launched in September of 2001 to bring back into print the classics of last century on the Social Doctrine of the Catholic Church and to spearhead a renewal of interest in the true Catholic approach to politics, economics, and social affairs -- is beginning an initiative, starting on October 30, 2011 (the Feast of Christ the King), to: transform its publishing program; spearhead a Catholic Land Movement; inaugurate a journal for Political and Social Catholicism; and develop an Institute for Catholic Social Doctrine and Policy Research -- all under the auspices of the new "IHS Press Group." Fundraising will coincide with a new web development project launching on All Saints Day (Nov. 1, 2011), and will run at least through the Feast of King St. Louis IX (August 25, 2012); results of these efforts will be announced at a Washington, D.C.-area conference tentatively planned for that weekend. Get our Email Bulletin for updates. Support the IHS Press Group. 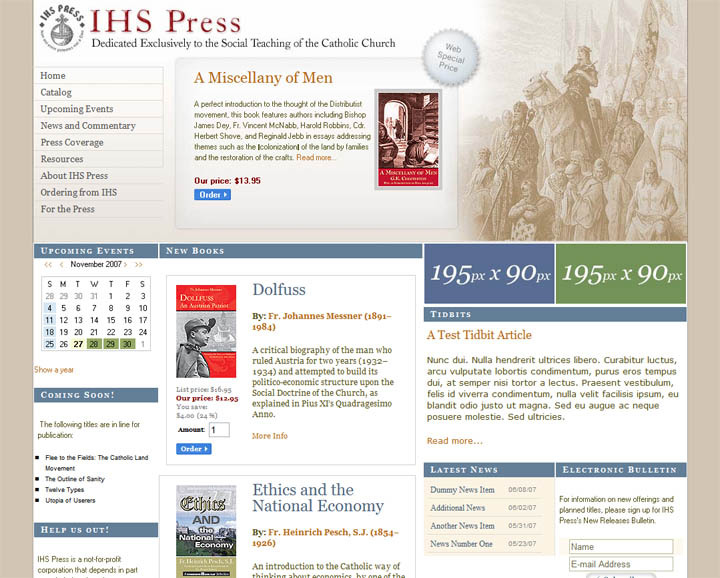 IHS Press is a not-for-profit corporation that depends in part upon help from benefactors to continue its mission of promoting and promulgating traditional Catholic Social Doctrine to the farthest reaches of the English-speaking world. All donations received from the Feast of Christ the King (Oct. 30, 2011) through the Feast of St. Isidore the Farmer (Apr. 4, 2012) will be earmarked, unless otherwise indicated, for the transformational effort currently underway to grow IHS into the "IHS Press Group." For more information on how to help, click here. Or click the button to contribute now; no amount is too small. About our currently advertised specials and new releases. Click here to jump down to where you can order our special "combo" deals. Many of our loyal customers (thank you) have called recently to inquire after our newly advertised titles, wondering why they are nowhere to be found at our antiquated website. As we are, as usual, facing a number of (happily not very serious) production delays with both our two new releases and our revision to our website, updating this old site has fallen to number 74 on our 1200-item "to do" list. A word of explanation and a "status report" is in order. Sadly, aside from our recent new releases, numerous of other relatively new titles are not featured on this legacy website. The detailed reasons behind this are as unpersuasive as they are inexcusable. That said, our new site, which you can get an "under-construction" preview of here and here, will, God willing, and barring the never unlikely scheduling disaster, be ready to roll sometime this fall (Sep. 2008). UPDATE (Aug. 1, 2010): As should be now painfully apparent, a scheduling disaster has, of course, befallen us. That disaster prompted a re-tooling of the old new website, and has led to the migration of everything to different open-source content, which will, we hope, prove more viable in the longterm. In the short term it has, of course, but the website upgrade back to just shy of the end of the world as we know it. Of course with God all things are possible, so it is likely that the web revamp will be done sometime before that. A hint of what is to come - very rough - is here. As promised, the new, new site will still include a number of nice features, including the option to get electronic versions of most of our titles, for viewing on an on-screen reader such as Adobe Acrobat or in the new ePub format readable on a number of new electronic platforms. This is for you Distributists trying to kick the habit of driving and learning to ride the train or bus to work, and who need something more interesting to look at than work e-mail on your "palm pilot" or "PDA" while you ride. That said, from this inadequate little box, you can order copies of our most recently advertised books, and, once again, please accept our apologies that these are not featured as they should be, with a full suite of images and information. It's coming SOON, we promise! 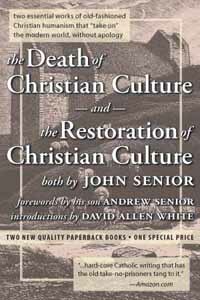 John Senior's timely and timeless classics available again. More details will be avaliable in the near future at our new, upgraded website. Meanwhile, for more information on the books and additional details, click here to download a PDF-format postcard. Light in the Darkness Publications. Established in the middle of 2005, LID Pubs is chartered with producing works dealing with current events and other topics of immediate newsworthiness. Kicking-off this new imprint is a two-volume anthology on the Iraq war, looking at the conflict in light of the perennial tradition of the Church's just-war doctrine, along with other legal, political, and historical considerations. The aim of this set is three-fold: (1) to recover and re-assert the true just-war doctrine in the face of its corruption by so-called "Catholic neoconservatives" who claim a right to attack a sovereign nation that has not committed an act of aggression; (2) to expose the sadly profound immorality of our nation's treatment of Iraq in the run-up to the March 2003 invasion and during the decade preceding; and (3) to illustrate the bankruptcy of the modern political categories of "left" and "right," "Democrat" and "Republican," "Liberal" and "Conservative," by bringing together an eclectic group of pundits, journalists, historians, and other scholars in a collection that transcends the sterile boundaries of current politics and tackles issues in view of the only criteria that matter: truth or falsehood, accuracy or error, honesty or deceit. It is, of course, according to these criteria that the Church's moral and political wisdom has so much to offer, and no modern case better illustrates this fact than the war in Iraq and its implications under just-war doctrine. To order this compelling collection, in high-quality hardcover at a discount of 20% off the retail price, click here now. 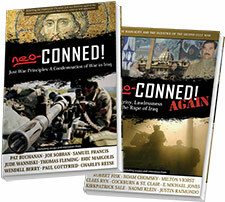 For more information on this exciting series, visit www.neoconed.info. Electronic Mail Bulletin. For information on exciting new initiatives, new offerings, planned titles, and other news, please sign up for IHS Press's New Releases Bulletin. Simply enter your name and e-mail below. If you would like to be on our regular mailing list as well, please click here. IHS launches a new imprint. IHS Press is pleased to announce the formation of Gates of Vienna Books, an imprint which will specialize in the re-issue of classics of Catholic history. Named after the famed victory of the Catholic West over the Turks in 1683 at Vienna, GOV Books plans to re-print the historical biographies of Hilaire Belloc, along with other works of import for a truly Catholic understanding of history. For more on this exciting new imprint, click here. The Catholic Social Movement, by Henry Somerville. Last of the Realists, by Harold Robbins. The Portugal of Salazar, by Michael Derrick. William cobbett, by G.K. Chesterton. Later volumes will include additional titles by Belloc, Chesterton, McNabb, and Robbins, and new offerings by Frs. Denis Fahey, Edward Cahill, Drs. 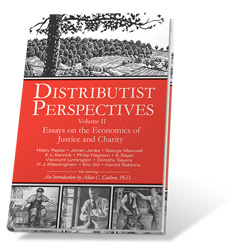 George O'Brien and Charles Devas, and many of the other Distributists and Social Catholics.